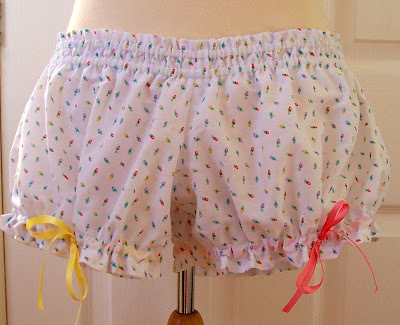 there was like a 5 minute delay between me finding the free pattern for the madeleine mini bloomers on colette patterns and me beginning to make them...and that time was spent waiting for the printer to finish printing the pattern pieces....they are hilariously cute!! As the nights get colder, and the heating goes on, as well as the extra-puffy duvet cover that we use in winter...i have to wear light pjs or would risk boiling alive in my sleep. I think i need to make a large quantity of assorted mini-bloomers for night-time wear!! These are soo cute, but only because they're petite. Don't bother doing me a pair! i think you should call these 'bloomets' - or as dario would say 'bloomlets'!!! !